You have a Docker container and you heard about Juju. Juju can deploy your Docker container to any cloud. This document will outline the best practices for using Juju to deploy Docker images. This document assumes you already know about Docker and how to create, pull and use application containers. Juju may be a new concept so you should get familiar with the technology, there is more information on installation and configuration of Juju software on https://jujucharms.com. This document will detail some of the higher level concepts of Juju. Another software paradigm is reactive programming. Do something when the state or conditions are correct. Juju offers the charms.reactive package to allow charms to be written in the reactive paradigm. In charms.reactive code execution is controlled by boolean logic. You can define when the conditions are right, run this code, or when something is not set, run different code or do nothing at all. The idea of charm layers is to combine objects or data into more complex objects or data. When applied to Charms, layers allow you to extend or build off other charms to make more complex or useful charms. The layer.yaml file in the root directory of the charm controls what layer(s) will be imported. The docker charm makes use of the charms.reactive python framework. The code for the docker layer can be found in the reactive/ folder in the root charm directory. The docker layer makes use of the Charm Layers concept building off the base charm and creating its own layer of added functionality. The layer-docker charm can be found on github.com at: https://github.com/juju-solutions/layer-docker. This charm encapsulates installation and lifecycle management of the Docker daemon, emitting events such as docker.available, and forthcoming support for the plugins that Docker is growing. This charm is designed to be a base for other docker based charms. When you run charm build the resulting charm will contain all of the logic to install and upgrade docker. Freeing you to focus on delivering your application layer and focus on how to do that. In the first section we illustrated the workflow. The resulting charm will be a simple method to serve static content with NGinx, including a relation to a load balancer charm. We're going to be dissecting each section of the layers. To give you a top-down view of what we'll be examining, the following illustration will provide the "big picture" view of the end product as we start to decompose each of the layers and accompanying code. An example of a charm using the reactive pattern is the layer-docker charm. It also uses the compose workflow and can serve as the base for other Docker charms. This document will focus on the reactive parts of the layer-docker charm. You can read more about layers in the +building a charm with layers documentation. Making a charm "reactive" adds two directories (reactive and hooks/relations) to the basic charm structure. The layer-docker charm only has a reactive directory because it does not add (or provide) any new relations. Inside the reactive directory there is a file docker.py. The reactive framework goes into the reactive directory and finds the docker.py file. The file contains a single function named "install" which has a decorator @hook indicating this function should be called on the install event. The reactive framework handles hooks in a special way. All the hooks of the same name will be run in a non-deterministic order, so generally only one layer should implement a hook for best results. This install hook creates a path to an install script and calls the script to install Docker. After Docker installs it calls the reactive set_state method. This method puts the "docker.available" state in the reactive framework so that other layers know that Docker is installed and available. The layer-docker charm is a great example of how small and focused a charm can be when it uses reactive and compose concepts. States can be thought of as persistent events. The code using the reactive framework can set and remove states. Other code known as handlers can use the boolean logic to run when the state or combination of states is correct. States may be useful to other layers so it is very important to document in the README.md what states are set or removed in this layer. 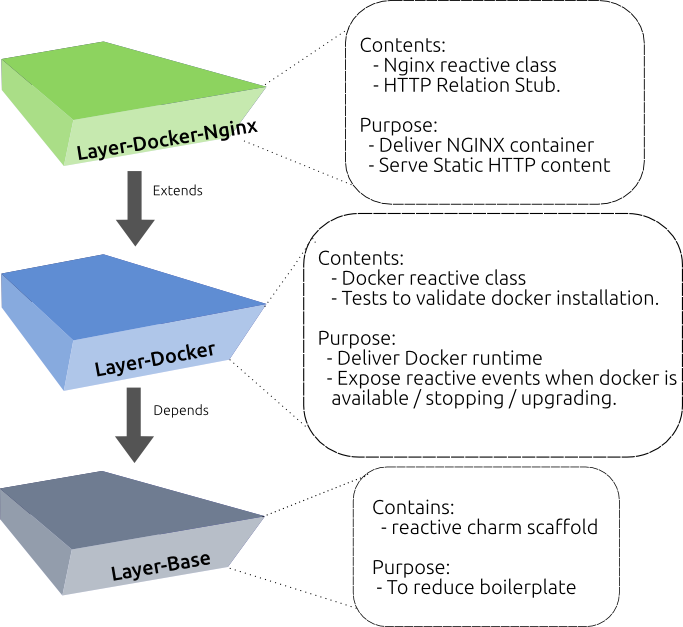 The layer-docker-nginx charm adds the Nginx HTTP server docker image to the layer-docker charm by using charm compose and also uses the reactive framework. The layer-docker-nginx charm can be found on github. Inside the reactive directory of the layer-docker-nginx charm is a file nginx.py that contains all the code for this charm. The nginx.py file contains a "config-changed" hook that is called when someone changes a configuration value in Juju. This function uses charmhelpers to determine if the port has changed and the container needs to be recycled. The nginx.py file contains several functions that make use of the reactive framework. The @when and @when_not are charms.reactive decorators. The decorated functions are only run if the conditions match the current state. The functions described here are specific to the nginx workload, but the concepts can be extended to the other Docker worklodas to write your own charm with the layer-docker charm as the base. The layer-docker charm sets the "docker.available" state after installing and configuring Docker. The install_nginx function is decorated with @when('docker.available') meaning that the code will run after Docker is installed and configured. The install_nginx function sets the state "nginx.available" when it is complete. the service in an inconsistent state. This function handles running the nginx container which many Docker charms will have to do. The run_container function is decorated with two decorators @when('nginx.available', 'docker.available') and @when_not('nginx.started'). The @when decorator indicates the desired states and both must be set before the run_container function is executed. The @when_not decorator indicates the state that must not be active for this function to run. Since the run_container function sets the "nginx.started" state this ensures the container is not started over and over again. and provide feedback/notifications to the end user. # Run the nginx docker container. The stop_container function is decorated with @when('nginx.stop', 'docker.available'). The "nginx.stop" state is an indication to stop the container in which case it will set the "nginx.stopped" state. The decorator @when_not('nginx.stopped') protects this function from being called repeatedly. Note the reactive.remove_state('nginx.stop') and reactive.set_state('nginx.stopped')calls to assert a stopped state. The configure_website_port is a function that handles the http relationship, specifically the port. This function is decorated with @when('nginx.started', 'website.available') to only run when Nginx is started and the website is available. The layer-docker charm was designed to be a base layer for other charms that want to run Docker style application containers. By using the reactive framework the charms that you write can be very small and concentrate on the application or applications that your charm provides. Use the compose workflow and reactive framework to create a new charm with your Docker image very similar to the layer-docker-nginx charm.